Update 3/2013: This essay won Honorary Mention, Intercultural Essay Category at the recent Soul-Making Keats Literary Competition. Kain na tayo. Let’s eat!” A group of us had been invited for dinner at the home of Filipino poet laureate, Oscar Peñaranda. We planned to talk about a travel project that he started in 2009, when he had escorted his first group of Filipino-American writers, musicians, and educators to the Philippines, many of whom had never visited there. As we filled our plates, he came over to me. “/lock – bye/ what?” I answered. “Loob. It means “inner self.” Lakbay-loob—journey to your Inner Self. Start saving up,” he said. It took me awhile, but save I did. Finally, in the spring of 2012, I made it to the Philippines for the first time. I celebrated my 56th birthday in Davao, Mindanao. Embarking on lakbay-loob, I felt like a child again. I was delighted to ride side-saddle behind the driver of our pedicab. I felt daring when my legs, dangling off the side of the scooter, came within inches of the vehicle next to us. When an innkeeper brought me a cup of hot tsokolate (cocoa) made from freshly shaved chocolate accompanied by a slice of mango and the purple-colored puto—a rice cake made with the ube root—I had to hold back tears. The simple treat of a cup of hot chocolate reminded me of my mother, who died when I was a young girl. It was the loving way that the woman placed it before me, the smile, the simple words, “There you are, dear” that triggered my reminiscence. Lush greenery, the aquamarine water of the Philippine Sea, the chattering of bamboo leaves in the wind—everyday things played with one of more of my senses. 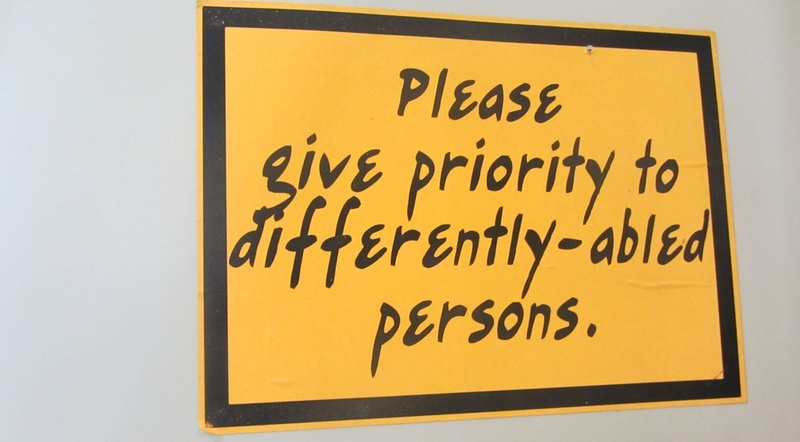 Even everyday signage made their impressions. I was too jetlagged to ask Oscar to elaborate on it, but I imagined men reaching into their jeans pockets and tossing 9mm Keltecs into a plastic bin. Would they unsnap a leather sheath on their belt strap and throw in their knives as well? Would the hotel clerk give them a claim ticket? 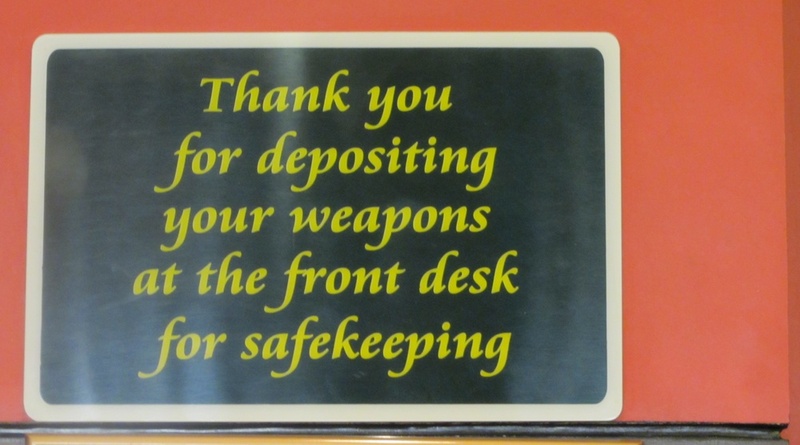 Should I be on guard for gunshots from the room next door in case a lover’s quarrel breaks out? Are there Filipino cowboys who play quick-draw-McGraw on the streets of metro Manila? I had memory flashes of living with my grandmother in San Francisco and wondered further if having a weapon might be a common Filipino thing. One time my great uncle threatened to “get the gun” and shoot his brother-in-law when his Ilocano temper flared over some whiskey-induced argument. I was in college by then, and remember eavesdropping from the living room, having to intervene when Uncle actually started going to his room to fetch that gun. The soft sweetness of the request resonated with gentle wisdom and manner, again rekindling the memory of my good-natured mother. She never came to the Philippines, and I felt in a way that my trip to our ancestral homeland was for both of us. I lit a church candle in her honor in every province. 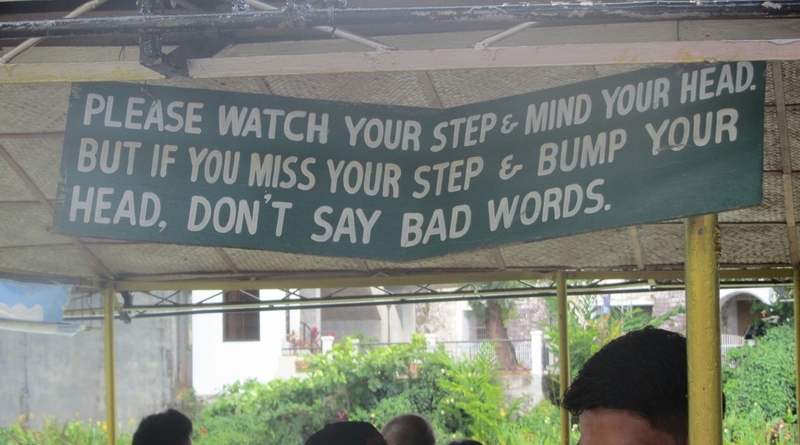 In the Philippines Eat All You Can is the equivalent expression to the American English, All You Can Eat. When it came to eating meals, I never chose the Eat-All-You-Can option because the stainless steel buffet line simply was not as appealing as the freshly made portions of eggplant omelette, pork shank called crispy pata, fried chicken, ground meat sisig, and garlic rice brought steaming hot and aromatic, to our table. On the other hand, Eat-All-You-Can became the new mantra for my approach to life. Eat all you can, but let every little moment linger like that little plate of mango, or that last morsel of crispy pata. I was hungry to take in everything around me. In the beginning, like the love struck first-timer that I was, I shamelessly snapped photos of fast food signs in the sprawling Manila malls. A bread shop called Dough-Joe. Shoti Squid Balls. Balut Eggspress. Pasta & Pancit. Pork on Fork. On the island of Bohol, I took a tour with fifty other passengers along the tranquil Loboc River. You know how here in the U.S., the food service on a boat is provided at a snack counter, the refrigerated food presented to us in pre-packed containers, for optional microwaving? Not in Bohol. A buffet table --accessible from both sides–ran down the center of the boat. The food was served on platters and bowls and I felt as if we were at a family dinner in someone’s dining room! The offerings included a local fish dang-bato, hearts of banana with coconut milk and curry, jackfruit- langgka, the noodle dish pancit canton, chicken adobo and finally, my favorite vegetable dish pinakbet. I ate amid the surrounding nipa palms, quiet waterfalls, and the lullaby of songs sung to us in Visayan and Tagalog. Eat all you can, I thought to myself. Our travels through the Philippine provinces brought us to Mindanao. Across the street from MyHotel--that was the name of the hotel--we discovered the Kusina Dabaw restaurant. For 40 pesos, the equivalent of $2.00, we could get a cup of coffee and a bowl of arroz caldo– steaming rice porridge seasoned with bits of ginger, chicken, and green onions. Durian is a fruit approximately the size of a cantaloupe. When its hard spiky shell is cracked open, a thick, gassy odor escapes. It’s a smell somewhere between a PG&E gas leak and a fart. And, this durian fruit for which Davao is most famous is also forbidden in other public places including buses and stores. 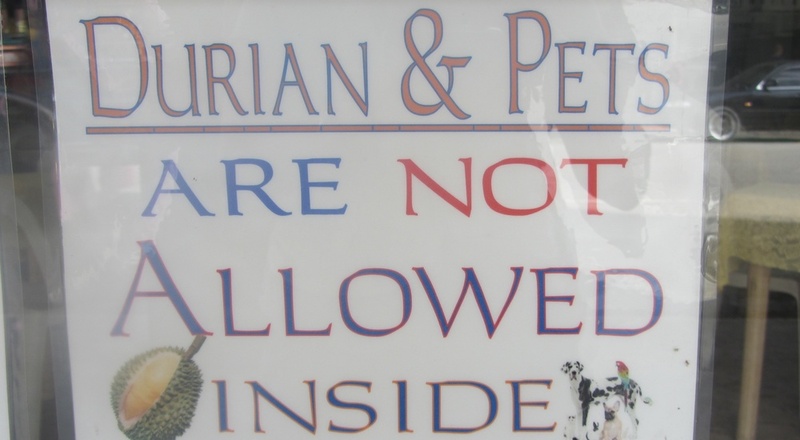 Come in and eat all you can, but leave your stinky durian and furry friends outside! Since my travel to the Philippines, I have continued to discover the root from which my inner spirit vibrates. Meeting my late mother’s relatives for the first time, and laughing so easily together, as if we had known each other forever, filled my soul so much that I still feel it within my physical body. The love that I could so easily feel for them came back to me in volumes. I now celebrate myself as the third generation Filipina-American—half Ilocana and half Cebuana from American-born parents. The signs were simply placards. But this one confirmed for me that a very fine journey lay ahead. Freshly baked pan de sal handed over a bread counter by people who look a little like me warmed my heart. The cacophonous banter of roosters and the choir of barking dogs that always followed made me feel alive. The soft fragrance of greenery and flowers kissed my cheeks during early morning walks, and I felt embraced. When all of my senses aligned themselves in this way, I knew mine was a pilgrimage--this lakbay-loob--blessed by the ancestors. Calling me by my childhood name, I heard their voices in the breeze: Lisa-Tita, eat all you can. Lisa Suguitan Melnick is a professor at the College of San Mateo and teaches in both the Language Arts and Kinesiology divisions. Her life exemplifies the symbiotic relationship between learning and teaching; thus, she thrives best as a student of something at all times. In 2012, she visited the Philippines. Lisa’s travel log at http://sampaguitablog.blogspot.com and her writing projects at http://alyssumblog.blogspot.com.